With a large, doleful eye and a blunt face that slants down to a drooping mouth, few fish look as glum-faced as a John Dory. 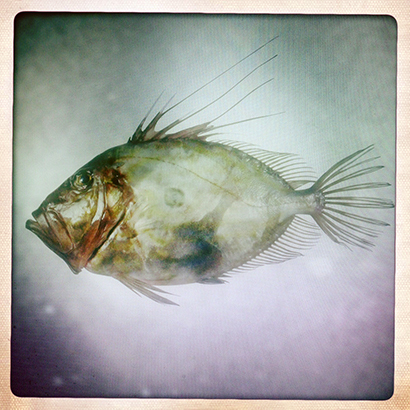 Strange really, because with one of the coolest latin names of any fish – Zeus faber – and connections with none other than the Patron Saint of fishermen, St Peter, the John Dory really ought to swim with a swagger. Perhaps he knows how good he tastes – and how popular his flesh if becoming. Being largely solitary, the John Dory is not often targeted by anglers, though the large gaping mouth that it uses to swallow smaller prey fish, is quite capable of taking all manner of lures and baits. They are a fish extraordinary in appearance. Aside from the miserable expression, the body is deep and rounded and the fins an array of billows and spines. In the middle of the fish is a large black spot, which was supposedly delivered by St Peter himself when lifting the John Dory from the Sea of Galilee. Seeing as Galilee is freshwater and the John Dory a fish of the sea this would seem unlikely. And as for his name, ‘dory’ is widely accepted to come from the French dorer – to gild – whereas ‘John’ was added as a familiar, much in the way of a ‘jack pike’.